Here is quick background done using a simple masking technique and blending distress inks. 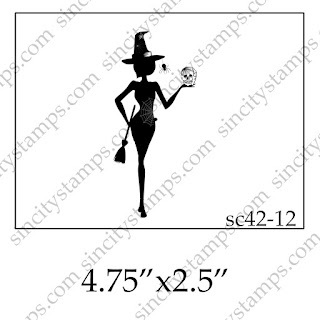 It is a useful technique that allows you layer your stamping and avoid having to fussy cut a intricate and delicate image like this witch silhouette. 2. Next, place the mask over witch image. 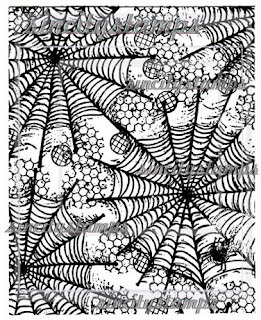 Load the cobweb stamp with embossing ink and stamp the design over the masked witch image. 3. Remove and discard the mask. Then apply silver glitter embossing powder to the cobwebs, shake off the excess, and heat set. 4. Next, apply ink to the background using a ink blending tool. Add lime green around the witch to create an eerie glow and then blend orange & purple randomly to bring out the cobweb background pattern. 5. Matte the stamped image with silver mirror cardstock and adhere to a black card base. Next, add a 3D embellishment for her to hold. 6. Then stamp a "Happy Haunting" greeting using black ink and matte with silver mirror cardstock. Adhere it to the lower right partially overlapping the edge of the card. Finally, embellish the card with cat button. Love this! It's elegant and perfect. This card is fabulous! I love the way you put all the different elements together into one cohesive scene. That witch is such a sassy fashionista! I loved seeing the detailed process shots you included, too. This is a stunner and I am so glad you shared your talents with us for this week's Simon Says Stamp Monday Challenge!